In the event that we do not have a foster rabbit which meets your needs, Indiana House Rabbit Society attempts to link prospective adopters with shelter rabbits available for adoption state-wide. 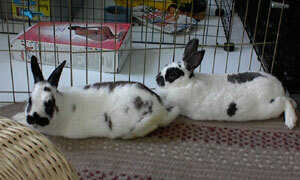 Read about our incredible adoption value for single rabbits or bonded pairs! Participate in a telephone consultation. 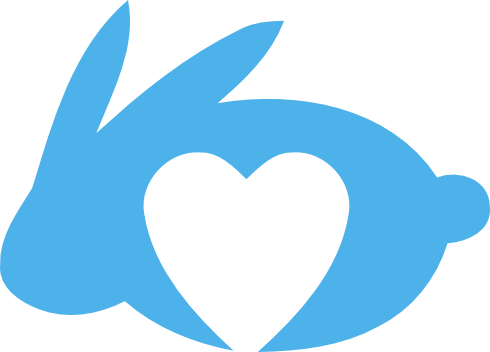 We are happy to answer any questions on rabbit behavior and rabbit care! Assemble supplies for your new rabbit companion and contact us when you are ready! Arrange for a time to attend a matchmaking session. We will arrange one visit in a centralized location to help you find a rabbit you bond with! Review our resources in introducing rabbits to determine if the bonding process is right for you, your rabbit and your family. Participate in a telephone consultation. We would love to learn as much as we can about your existing rabbit to suggest the best matches for his/her personality! Assemble supplies for your additional rabbit companion and contact us when you are ready! Arrange for a time to attend a Bunny Date. We will arrange one visit in a centralized location and bring all eligible bachelors/bachelorettes. Indiana House Rabbit Society volunteers will facilitate the introduction and narrow the potential choices based upon behavior. We will then coach you through introducing your rabbit with the finalists to help you make the best choice. 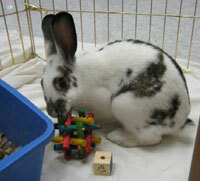 Receiving a minimum 14 hours of supervised exercise per week, even our Adoption Center rabbits! View rabbits available for adoption!